Years after her husband died unexpectedly, Denni Thompson can’t bear to think of giving her heart to anyone else. With three newly married sons, a grandchild on the way, and a busy life, Denni doesn’t give a thought to romance until she meets the handsome new owner of Grass Valley’s gas station. “You’ve got to be the sweetest man ever, as Cass would say,” Denni said, placing the hummingbird on the counter and looking around. Amy had mysteriously disappeared into the back room, leaving Denni alone with Hart in the store. She wasn’t sure in her current frame of mind that was a good idea. She might give in to her desire to hug him again. Thoughts of kissing his strong jaw or that darn cleft in his chin filled her mind and she wanted to stamp her foot in irritation. She was not, under any circumstance, going to allow herself to get involved with a man. Especially not the tenderhearted cowboy who brought her hummingbird figurines and made her feel young again. “That’d be great, Denni. Give me a call Saturday when you’re ready to come over and I’ll be waiting to give you a grand tour.” He tipped his hat and walked outside, letting in a breeze of frigid air that did nothing to cool Denni’s elevated temperature. 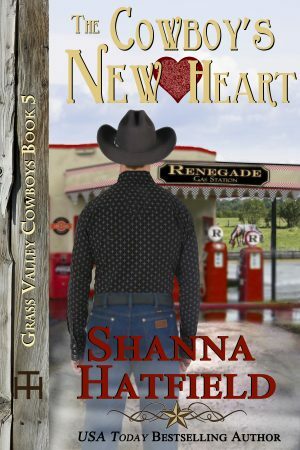 Watching Hart saunter down the sidewalk toward his pickup, Denni felt her cheeks heat as she thought about how well he filled out his jeans, how good he looked in his boots, hat and leather coat. He could easily pass for someone several years younger than his fifty-two years. She felt a hot twist of jealousy when she noticed a couple of women walk past Hart then turn around and give him a second glance.